HeyPlantMan! Exotic Tropical Plants from St. Pete FL: January 2013 - another year, here we go ! January 2013 - another year, here we go ! Bringing in the New Year, we have some fabulous plants for your gardens and homes ! 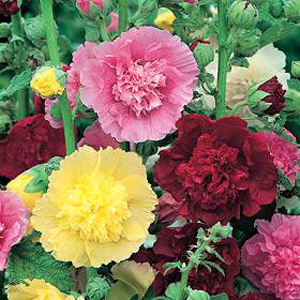 It's that time of year when the Tropical perennial Hollyhocks are springing loose and we got them in Crimson, Purple and Pink. This popular beauty does great in Florida in our areas, especially loving the cooler weather. Reaching to 3ft tall, the blooms are very long-lasting, than the plant produces seed that can be propagated. Cut back the original plant and soon you will new growth going forward to Spring and Summer. Lavender - Who doesn't love the smell of lavender? 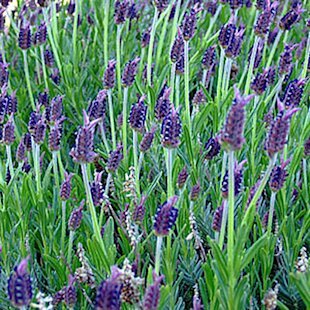 Grown just for its gorgeous color and aroma, people can dry it out to use in potpourri, or in the bath, and have you ever made lavender cookies?! Another specimen that loves our cooler weather and take lots of sun all day. Continuing with our aromatics, who doesn't love Rosemary? Widely popular used as an edible herb for Cooking, Rosemary is also a Cold Hardy, sturdy landscape plant. She loves lots of sun and good water to get established. Yes, you don't have to grow it THIS big, but isn't she a thing of beauty? Herbs do great in-ground or in containers. Mix Rosemary with other Herbs, such as Basil, Thyme, Oregano etc and you can have your own Herb garden that fits any size property, Porch or balconies. 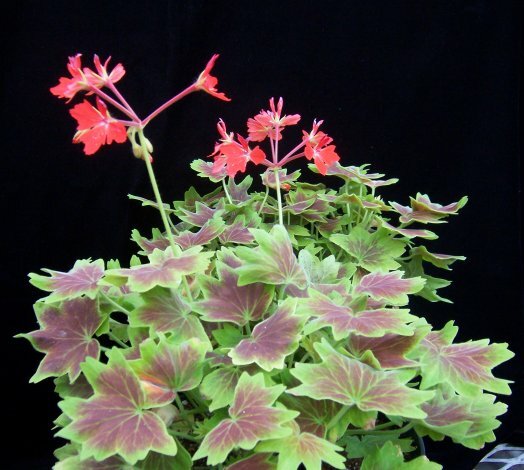 Vancouver Centennial "Maple Leaf" Geranium - Back in stock, this hardy geranium will live for years and it's striking variegation is lovely to look at, even when it's not blooming. Can take lots of sun or a bright sunny porch, don't keep it too wet, and it will reward you with years of blooming. Anyone noticing the abundance of hungry caterpillars in their yards lately? Because of our relatively mild winter so far, these sweethearts are hungry and looking for some good chow, so it's a great time to put in new Milkweed to satisfy their cravings ! 2012 ended a bit chilly and rainy but going forward, it's going to be a beautiful weekend to get out and about to Markets, so drop on by and see us for the above beauties as well as loads of more great stuff. Also, note ! We are going to be returning now and then to the popular Sunday Morning Market at Tarpon Springs, soon, so stay tuned for news of that in our schedule. Spring will be approaching fast and we've got a full line up of great Botanical Shows coming up, so keep in touch for news about them. As always, need some plants during the week, drop us an email and we will be happy to set up an appointment in St. Pete to meet with you. For now, onward into a Prosperous 2013 for all of us.